Check that there is two-way communication with the digitizer by pressing Enter. The digitizer should reply with ok on a new line. Type re-boot to reinitialize the digitizer, and confirm with y. 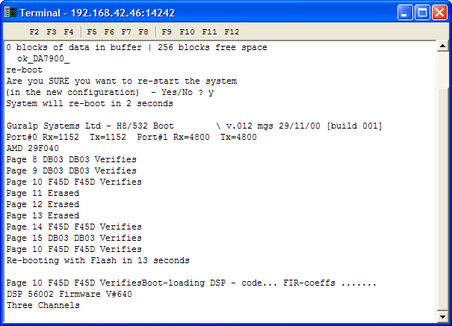 As it is restarting, the digitizer will report its status over the terminal connection. After a short while, the digitizer will pause. 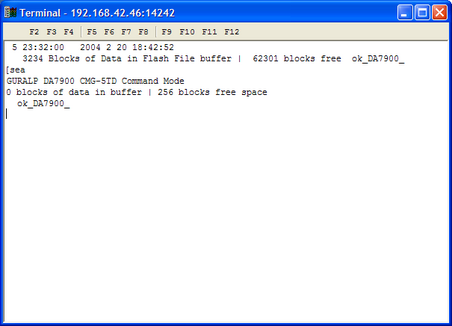 If you do not enter a command in the next 13 seconds, the digitizer will continue booting up normally. 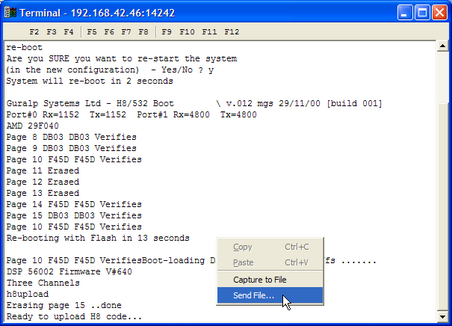 To update the firmware, type h8upload during the pause and press Enter. If the digitizer replies 8upload undefined (or similar), it has failed to receive one of your keypresses. Type h8upload and press Enter again. 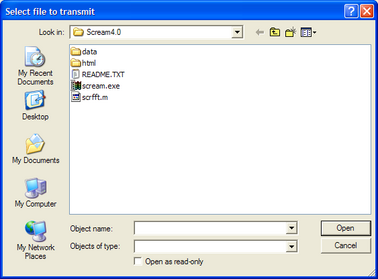 Whilst the file is loading, a progress window will be displayed. Depending on the speed of the link, it may take up to 20 minutes to transfer the firmware. Once the file is fully transferred, the old installation will be backed up and the new one put in place. This will take a couple of minutes. When you see the READY ok> prompt, wait for about 30 seconds, then hit Enter a few times to verify that the digitizer is awaiting your input. Finally, type re-boot to restart the digitizer with the new firmware, and close the terminal window to resume data transmission.